Hi Everyone! 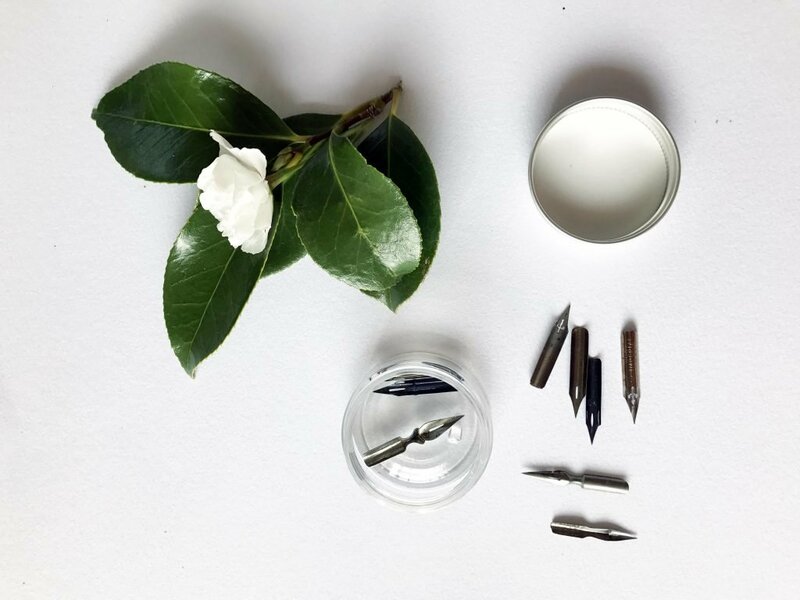 After seeing the ongoing comments about what ink, nibs, pens I use in my Instagram posts, I’ve decided to make an official blog post that lists all of my favourite calligraphy supplies, to date. Unlike my beginner’s guide, which primarily covers the basic materials to get you started in calligraphy, this list is more based on MY personal preferences and experiences. So it’s important that you spend the time to try out different supplies and see what works best for yourself as well. Let’s start with one of the most commonly asked materials, nibs. There are so hundreds of options and I love to explore as many different types of nibs as I can. I have recently fell into the world of vintage nibs, so I will also cover that a little bit. Contemporary nibs are quite easy to access and there are a list of commonly used nibs. I no longer use stiff nibs such as G nibs as I have developed a light hand for writing after practicing Spencerian script and flowy modern script. Moreover, soft nibs work better on more surfaces, including delicate handmade paper. I have included links to Instagram videos where I used each nib! 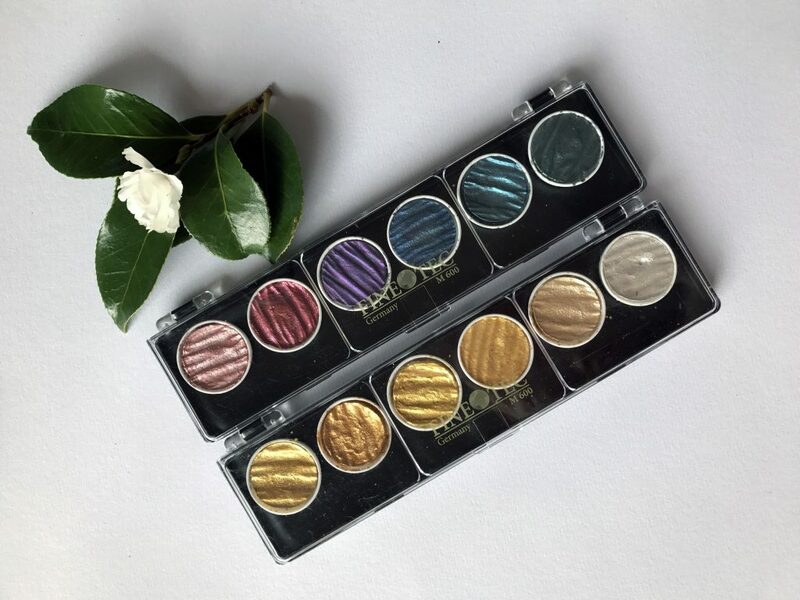 Surely you guys already know that I can’t live without my Finetec Palettes! If this is new to you, no they are not eyeshadow (people have asked me that before! ), Finetec pearl colors and metallic gouache with extremely fine pigments and they really reflect the light. And extra points for those delicious looking pan textures! A good quality and versatile white ink is a must if you are doing calligraphy. 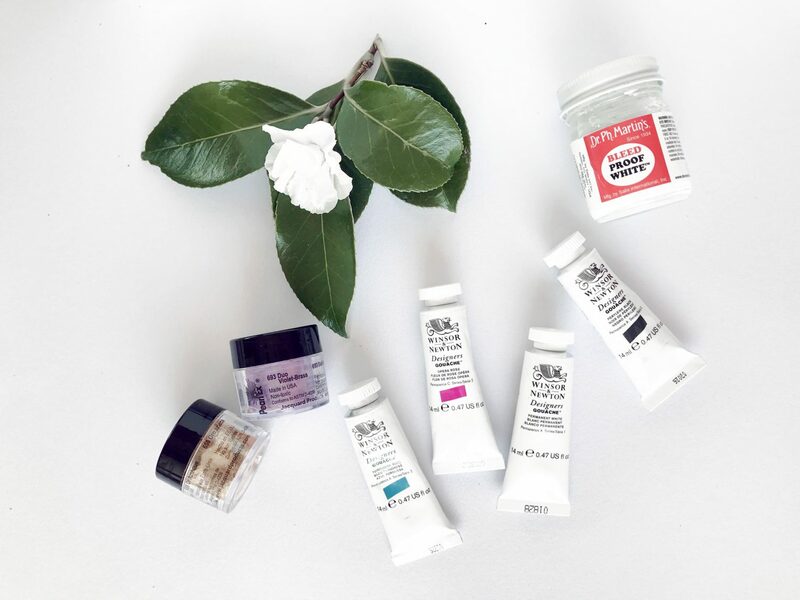 The traditional Dr Ph Martin’s Bleedproof white has been my favourite white ink since I started using it. It is widely used by artists in many fields so it can be found in most art stores. When you first open the bottle, it might come in a thick suspended paste, all you have to do is add water to it mix it until it feels like an inky consistency. Pearl Ex: Like Finetec mica watercolours, Pearl Ex by Jacquard Products are metallic pigments that can be used for a variety of purposes. Mixed with Gum Arabic and water (Approx. 4 parts pigments to 1 part Gum Arabic), it produces a lovely shiny ink that often dries with a raised or embossed effect! I also love to add Pearl Ex pigments to matte inks sometimes to produce an iridescent effect, and add finishing touches to my wax seals. Tip: I always keep a little bottle of Gum Arabic next to me as paints and inks aren’t always made perfect for every situation. Writing on some surfaces can require more Gum Arabic than writing on other surfaces, so it’s always convenient for me to reach for that drop bottle and remix my ink. Gouache: It’s a water-based paint medium that’s a little more opaque than watercolour. I love my Winsor & Newton Designers’ Gouache because they produce very fine lines and come in beautiful colours. I often mix a tiny amount with generic inks to achieve subtle colour variations or ombre effects. Length – Can depend on how much movement you use in your writing. 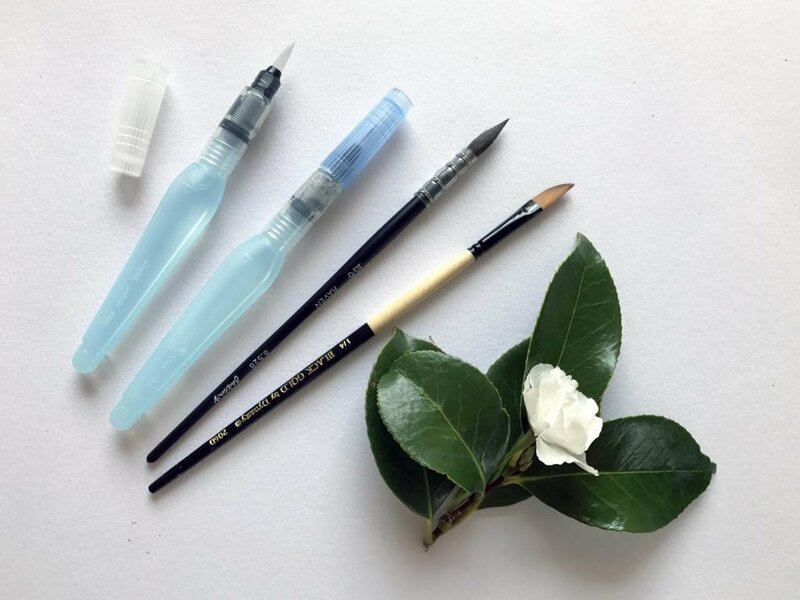 I love my set of Pentel Aqua Brushes as they are so convenient and versatile. They are sold in three sizes and I find them extremely useful for detailed work and also brush pen lettering. Laser level for guidelines: The one I’m using here is the Bosch Laser level and it saves me SO MUCH time. There are many small laser levels and I’m sure they all work the same way. I normally line up my writing paper and laser adjacent to lined paper so that I can follow a consistent spacing. From making a card with metallic ink to addressing 300 wedding place cards, this pretty has saved me so much time! Forget the laboratory magnetic stirrers, this one is certainly a calligrapher’s statement piece. It is designed by the Australian Designer and Pen-maker Luis Creations. This ink stirrer is specifically designed for calligraphers so it is a light and portable battery-run magnetic stirrer with incredible aesthetics! 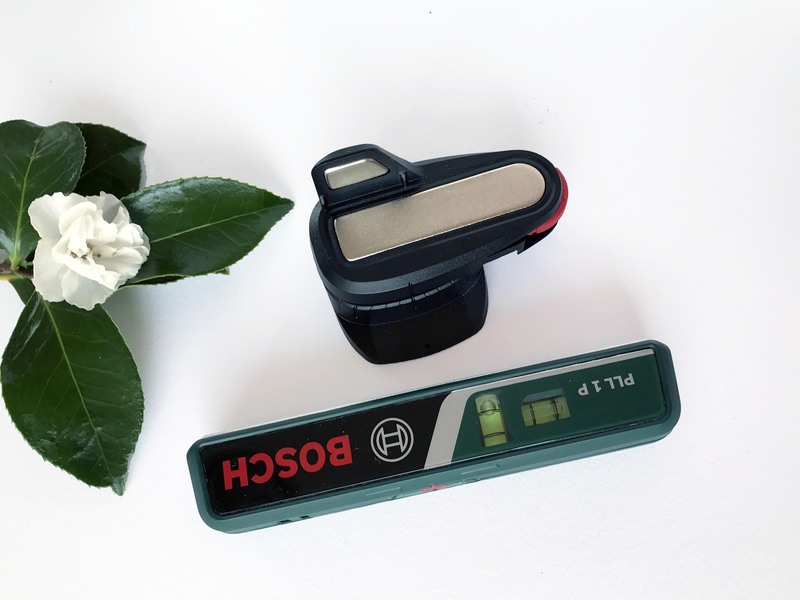 What’s even better about it is that it comes with very tiny magnetic bars with a raised centre, allowing it to fit nicely in small ink jars and also work quietly. 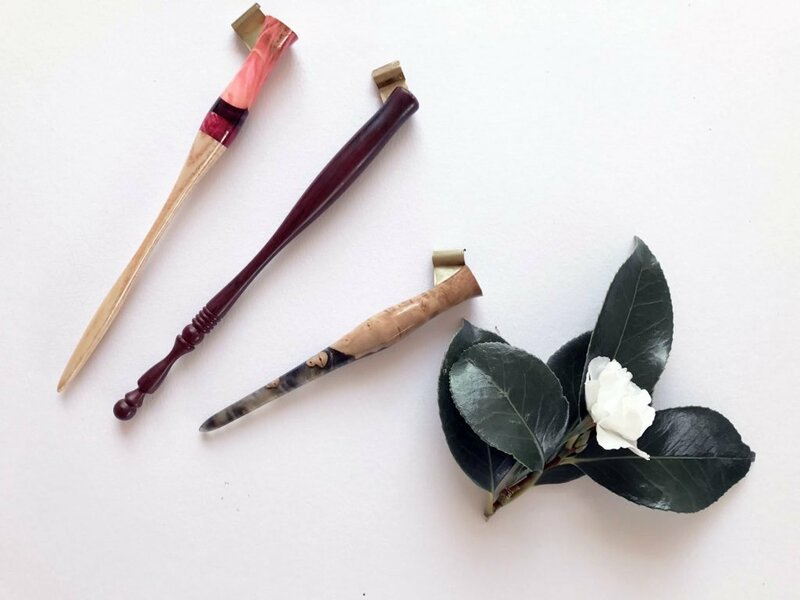 I am also excited to have the chance to stock some of these ‘Soap’ ink stirrers and you can find them here. Thank you for sharing this awesome list! I love your work!! I love your work and the way you write. Thanks for sharing! Please sign me up for your blog posts!